Virgin and Child with Saint John the Baptist (detail), by Sandro Botticelli, c. 1490. The Clark Institute, Williamstown, Massachusetts, United States. Honestly, it’s an image I fell in love with as soon as I saw it. When Catholic Relief Services sent us a prayer card featuring a detail of that image, I thought it was one of the most beautiful images of Mary and Jesus together that I ever saw. I love the way that Mary is looking adoringly at Jesus, with her mouth parted just so slightly as if she is breathing in his essence. I love the way that Jesus clings to her neck, yet looks out at us with those perceptive eyes that seems to be take in the entire world. I love his chubby little arms and fingers. In short: I love the picture. It is the picture of absolute joy. Virgin and Child with Saint John the Baptist, by Sandro Botticelli, c. 1490. The Clark Institute, Williamstown, Massachusetts, United States. 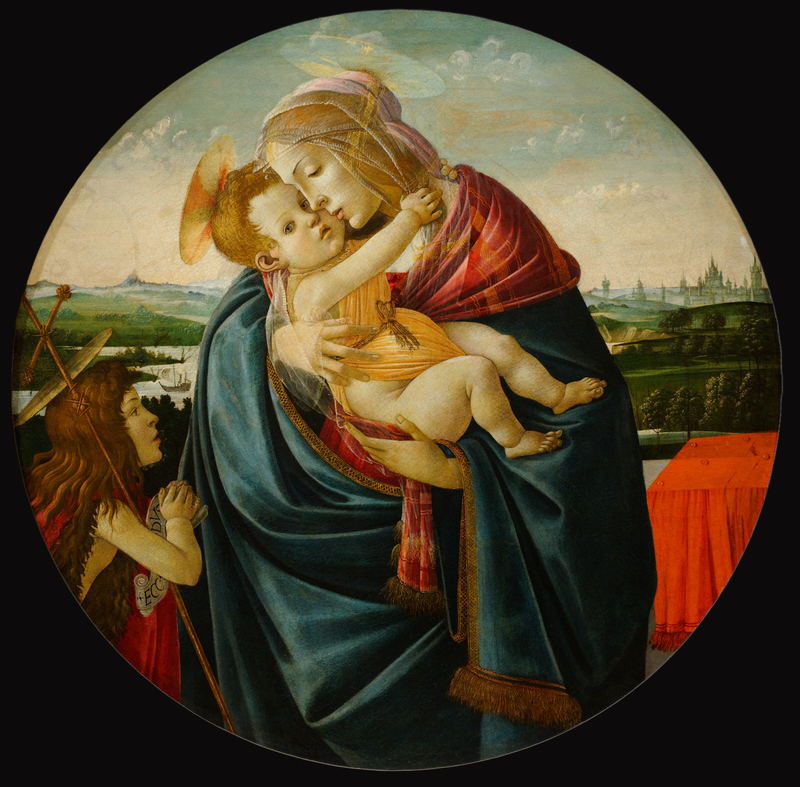 So, the focus of this artwork (which is circular, indicating that it was a private home devotional) is Mary and Jesus share a special moment together. However, it also has an appearance of a young St. John the Baptist! And, just in case you’re not sure if it’s really him, there are certain identifying symbols of him! The scroll that St. John the Baptist carries says, “Ecce Agnus Dei” or “Behold the Lamb of God” which are the words that St. John the Baptist would later say when seeing Jesus come to him in John 1:29. He also holds a staff of the cross that he is commonly depicted with as an adult in art in pictures of the Baptism of Christ. So, it’s a really cool picture! And when I was trying to design the cover of The Joyful Mysteries, I knew exactly which image I wanted to have on the front: the detail of Jesus clinging to Mary. And, when I realized that I need to have title pages as well to make the book flow beautifully, I was quick to put the full version in the book! What can I say? The joy, both Mother Mary’s and St. John the Baptist’s face, is so overwhelming. And what better way to describe the Joyful Mysteries than this beautiful picture? After all, to be joyful is to look on the face of Jesus and adore Him. And who better to lead us through the Joyful Mysteries than our Blessed Mother, who held the Christ child in her arms and adored Him? What was the first thing that drew you into the detail picture? What was the first thing that drew you into the full picture? How do you immerse yourself in the joy of Christ? Thank You for immersing us in the joy of your presence. Let us rejoice in You always. This artwork is featured in The Joyful Mysteries, which is a book that pairs every prayer of the Joyful Mysteries of the Rosary with classic religious art. You can take a peek at it here, or buy it at Amazon, Barnes and Noble, and Books-A-Million.